Below you will find many Kids' Halloween crafts as well as trick-or-treat crafts, scary crafts, costumes arts and crafts projects for children to make on their own and other arts and crafts projects for children. Make Foldable Halloween Creatures - These are easy to make and fun to play with....there is Dracula (Vampire), Frankenstein, a Witch, a Mummy, a Black Cat, and a random monster to make. 15+ Milk Jug Crafts for Halloween - Here is a great collection of Halloween crafts made with milk jugs. Halloween Spooky Ghostly Rattle Noise Maker House Decoration Craft - This is a fun arts and crafts project to use to scare Trick-or-Treaters when they get to your house. Hide behind a bush or something and pull the string to make a spooky, ghostly chains type of rattle every time a new visitor comes to your house. This can also be used to announce a new guest arrival to a Halloween party or to a Haunted House Party. Make a Robot Costume for Halloween with Cardboard Boxes - Any boy or girl can become a mechanical robot costume for Halloween and Trick-or-Treating with the aid of two packing cases and a little work. There is only one precaution, do your “scaring of friends and family” in a safe place if you can not see properly out of your mask. How to Make Halloween Lanterns for Spooky Halloween Decorations Crafts for Kids - Here’s a lantern that is a very easy arts and crafts Halloween activity for kids to make. And guess what- you can also use it to store your Halloween treats when you go trick-or-treating. How to Make Halloween Napkin Rings for Spooky Table Decorations Crafts for Kids - Are you looking forward to a special dinner at Halloween? Make some Spooky Spider Napkin rings to ” dress up” your table. Spider Web Plastic Bottle Bracelets - Find out how to make these spider web bracelets out of recycled bottles for Halloween. How to Make a Spooky Spidery Halloween Card With Easy Painting Technique - Here’s an interesting card you can make for Halloween. And the best part is that its really fun to do. Lets learn a new technique called blow painting. This unique Halloween Party Invitation or Happy Halloween card is easy to make and your friends and family will remember it for a long time. Trapped Witch Halloween Decoration - This is a really easy decoration prop to make for Halloween. With no effort at all, you can make it look like there is a witch trapped under your house. Make Halloween Jack-o-Lantern Candle Holder With an Old Teacup – Craft for Kids - Here is an easy to make, pretty Halloween Jack-o-Lantern candle holder that can brighten up your home this Halloween. Make a Halloween Pumpkin Tree Craft for Kids - This Halloween tree will add a nice touch to your living room. And you don’t even have to throw it away when Halloween is over. You can just remove the pumpkins and add stars and you’ll have a Christmas tree. How to Make a Halloween Skeleton Bones Necklace Craft for Kids - Have you decided what you’re gonna wear for Halloween? Here’s an interesting scary jewelry accessory you can add to your costume. Learn to make this easy-to-make skeleton bone necklace with just tissue and colored paper. How to Make a Ghost Halloween Party Invitation or Greeting Card : Craft for Kids - This friendly ghost will say “Boo” to scare your friends this Halloween. This unique Halloween Party Invitation or Happy Halloween card is easy to make and your friends and family will remember it for a long time. 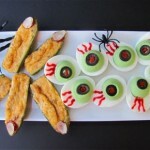 How to Make Creepy Halloween Eyeballs – I’ve Got My Eye On You! - Cobwebs and spiders are okay, but if you’re looking for really scary Halloween decorations, try leaving some of these eyeballs around the place! Today we will be making these creepy eyeballs that will gross all of your friends out. The easy arts and crafts instructions for making these gross eyeballs can be found below. Have fun! How to Make Halloween Treat Bags Crafts Idea for Kids - Today we will be making a Halloween craft that is easy enough for kids to do by themselves or with Mom and Dad. We will be making a handmade customized & personalized made Halloween paper treat bag that you can use as snack bag to give to a friend or trick-or-treaters.